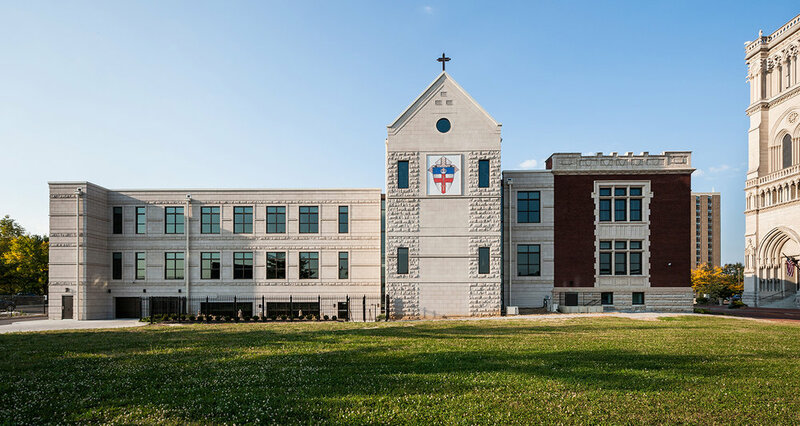 The site of the original wire cut brick and terra cotta structure was chosen to be the permanent home for The Diocese of Covington Curia Office. The site sits directly across the street from the limestone clad Cathedral Basilica of the Assumption. The masonry serves to unify the buildings into a campus and gives the Curia the needed mass to stand with the Basilica. It also provides the permanence and timelessness desired for the facility. The chapel is adorned with stunning marble floors, gracious wood paneling, and a deep blue painted ceiling. The altar and high windows provide space for traditional stained glass and the clerestory windows bring in dramatic daylight.